Janie Bress - My North Shore Blog: The North Shore Real Estate Market is On The Rise! The North Shore Real Estate Market is On The Rise! As a North Shore Real Estate agent serving Winnetka, Highland Park, Glencoe, Northbrook and Deerfield; I’m often asked how the real estate market is fairing. The North Shore offers a variety of housing types, but leans toward the high end market which lends to a more high stakes endeavor in real estate. Buyers and sellers along the North Shore tend to be very savvy when it comes to their investments and won’t settle for mediocrity when it comes to real estate. Because of their wise investment strategies, they’ll come to me with questions about the current market as their trusted North Shore Real Estate agent. 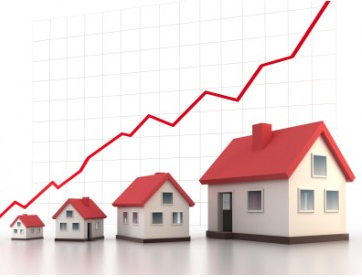 We're all aware that the past few years in the national and local real estate market have been troublesome, but recent reports are consistently showing the progress in the markets’ recovery. On the national level, CoreLogic recently released its July Home Price Index report. It showed that there’s been a year-over-year increase in home prices (including distressed homes) by 3.8 percent from July 2011 to July of this year. This jump was the largest seen since August of 2006, and is a huge encouragement for where the market is heading. This past July also marked the fifth consecutive increase nationally in both the year-over year and month-over-month basis as seen is the 1.3 percent increase from this past June to July. Not only is the national market headed in the right direction, locally the Chicago market is growing in strength as well! Local home prices saw their third straight increase according to the S&P/Case-Shiller index of Chicago area single family homes. For those of you who enjoy knowing the details, the increase looked like this: April to May an increase of 4.5 percent, May to June up 4.6 percent and June to July prices rose 2.7 percent. In this 20 city index around the Chicago area, the total increase in home prices was up 1.2 percent from last year. 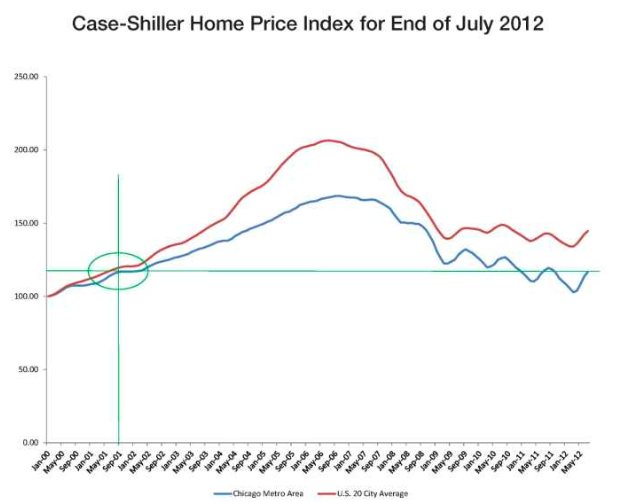 The below graph from Case-Shiller shows that home prices index for July in the Chicago metropolitan area climbed to approximately the September 2001 level. If you’re considering buying a home in the North Shore, I would encourage you to begin your search now before home prices continue to rise! If you have questions about these recent reports or would like to discuss your home buying needs; please feel free to contact me today. I would love to work with you to help you navigate the North Shore Real Estate market!